New Super Mario Bros. Plus is a mini-hack that serves like a DLC to simply add new levels to the game. 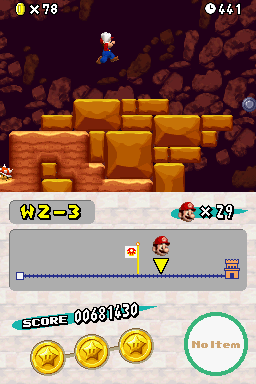 It has levels throughout the first 2 worlds that are fun and perhaps challenging, also packed with star coins. Feel free to try it out! This hack is my original hack that I first made back in 2014 as an experiment, but now I'm putting out as a finished mini-hack today. • Added new tilesets for ghost houses, underwater areas and spooky scary places. • Began on 4-1 and 8-1. • Changed title screen logo. • Started working on 3-2. • Fixed water opacity on 2-A. • Fixed view bug in 2-3. • The big update! Added 2-A, 2-Tower, 2-5, 2-6, 2-Castle, and began on 3-1! • Added new New Super Mario Bros. U tilesets! • Added new ? block, brick block, used block, and wood block graphics! • Change ALL the World 1 levels! World 2 also got quite a few changes, too. • Bug fixes (thanks thereturnofdoritosxD for showing me). • Added Levels 2-3 and 2-4! • Made some minor changes to some W1 levels. • Added the first W2 level, 2-1! It is a desert level, of course. • Made modifications to 1-Tower; it should now be easier to play. The secret exit area has also been changed a little. • Changed 1-3 from a remake level to a grassland level. • Made 1-A less difficult. • Changed the landscape of many levels. • World 1 levels added. • Those who developed the NSMB editor. You uses the hack name SnakeBlock was planning to use, but I guess it is fine. Game over, hamza. Nice hack, by the way. Oh, and the remakes are good, but people usually overuse remaking 1-1 of Super Mario Bros. So, don't reamke too much. Making your own levels makes your hack looks better. Thanks for the feedback! In the next update of this hack, I'll probably make 1-3 a normal athletic level. BTW Thierry how did you know Hamza (TileoidR) was gonna use that name? I would also advise against remaking levels too much. Back in the days when I was doing it, it was really more of an excuse to put together an easy level and palm it off as a 'reference'. It's ok to have some neat easter eggs now and then, just be careful to make sure it stays original. Thanks for the feedback, too. I've updated the hack to replace the remake level, modified most of the other levels, and added in the New Super Mario Bros. Wii tileset for underground and grassland levels. Edit: I put a video in the original post showing me go through the first level of the second world. It's still a work in progress, seeing as there are some areas with problems such as the first star coin and the exit door. 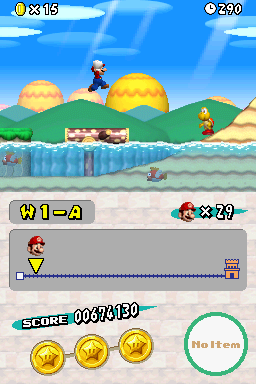 I've released a new version of the hack, NSMB+ 1.2! It adds the first desert level and changes some things in the castle and tower levels of the first world. I think I can approve this hack. By the way, I finished 2-3. Rather than being a Sewers level it's a Desert Underground level with some puzzles in it. It's kinda short and buggy, so I'm not gonna release it until it's time for another update. I love how you speed up the video when Mario gets to the goal. I'm probably not going to be releasing any updates for the hack anytime soon because I am working on a larger version of the hack. I'm planning on adding all levels up to the end of World 5 World 3 in this next update rather than releasing another lousy update that only provides one or two levels and maybe a change to World 1. That's....probably too much. Maybe about, uh, 5 levels for World 2 and 3? Yeah, probably. I'm just going to keep this on hold for a week or two and see if I can get done with all the levels up to the end of World 3 instead.